From Land O Lakes comes a premium quality cocoa mix. 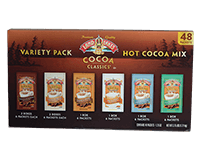 This combination pack contains 2 enjoyable flavors for chocolate hot cocoa mix. Contains a total of 48 1.25oz (35g) foil packets. Makes 48 servings, each containing about 140 calories. Ingredients: Land O Lakes Chocolate Supreme Hot Cocoa Ingredients: Sugar, Nonfat Dry Milk, Whey, Corn Syrup Solids, Dutch-Processed Cocoa, Coconut Oil, Salt, Hydrogenated Coconut Oil, Sodium Caseinate, Cellulose Gum, Potassium and Sodium Phosphate, Artificial Flavor, Mono and Diglycerides, Soy Lecithin, Sodium Steardyl Lactylate. Land O Lakes French Vanilla Hot Cocoa Ingredients: Sugar, Nonfat Dry Milk, Whey, Corn Syrup Solids, Dutch-Processed Cocoa, Coconut Oil, Salt, Hydrogenated Coconut Oil, Artificial Flavor, Sodium Caseinate, Cellulose Gum, Potassium and Sodium Phosphate, Mono and Diglycerides, Soy Lecithin, Sodium Steardyl Lactylate. Land O Lakes Arctic White Hot Cocoa Ingredients: Sugar, Corn Syrup Solids, Coconut Oil, Nonfat Dry Milk, White Chocolate (Sugar, Cocoa, Butter, Whole Milk Solids, Dextrose, Soy Lecithin, Artificial Flavor), Less Than 2% of Each of the following: Sodium Caseinate, Salt, cellulose Gum, Potassium and Sodium Phosphate, Dextrose, Mono and Diglycerides, Natural and Artificial Flavor, Maltodextrin, Food Starch, Gum Acacia, Soy Lecithin, Silicon Dioxide (Anticaking). Land O Lakes Mint Hot Cocoa Ingredients: Sugar, Nonfat Dry Milk, Whey, Corn Syrup Solids, Dutch-Processed Cocoa, Coconut Oil, Salt, Hydrogenated Coconut Oil, Sodium Caseinate, Cellulose Gum, Potassium and Sodium Phosphate, Natural and Artificial Flavor, Mono and Diglycerides, Soy Lecithin, Sodium Steardyl Lactylate. Land O Lakes Salted Caramel Hot Cocoa Ingredients: Sugar, Nonfat Dry Milk, Whey, Corn Syrup Solids, Dutch-Processed Cocoa, Coconut Oil, Natural and Artificial Flavor, Salt, Hydrogenated Coconut Oil, Sodium Caseinate, Cellulose Gum, Potassium and Sodium Phosphate, Mono and Diglycerides, Soy Lecithin, Sodium Steardyl Lactylate. Land O Lakes S'mores Hot Cocoa Ingredients: Sugar, Nonfat Dry Milk, Whey, Corn Syrup Solids, Dutch-Processed Cocoa, Coconut Oil, Natural and Artificial Flavor, Salt, Hydrogenated Coconut Oil, Sodium Caseinate, Salt, Cellulose Gum, Potassium and Sodium Phosphate, Mono and Diglycerides, Soy Lecithin, Sodium Steardyl Lactylate.